Are you ready to join CSA? A membership at CSA is a great way to get into sailing and with a number of membership levels, there is something for everyone! Modern facilities, year-round social activities, free camping and pool access, sailing lessons, and not to mention some of the best sailing in the midwest are great reasons to join! For more about our organization, please see our About page, or if you are ready to join, fill out the form below. First time primary members get a $400 discount! Code supplied after application is reviewed and before payment. Primary - Family Membership - $830.00 (USD) Subscription period: 1 year, on: January 1st No automatically recurring payments A primary membership is a family membership for the household, with storage for one boat 16 feet or greater in length. Additional boat storage is provided under a separate membership. half day at discounts rates. 5 half-day rentals are included. Season storage for paddleboard or kayak. FREE CAMPING. Access to club grounds, junior sailing activities, additional discounts for adult sailing seminar, 3-hour sailing instruction. Friend - $50.00 (USD) Subscription period: 1 year, on: January 1st No automatically recurring payments A Friend Member of CSA, is a membership to gain access to the facility, including parking. Typically, friend members are people who are regular crew of primary members or people who crew for associate members. Camping passes are not permitted to Friend members at this time. Junior Associate - $50.00 (USD) Subscription period: 1 year, on: January 1st No automatically recurring payments This membership is specifically for junior sailors which provides access to use the CSA Junior Club Boats with registration in one or more junior programs. Additionally, this membership allows storage for those who own one junior class boat (Open Bic, Optimist, Laser, Snipe, etc) at CSA. Love our lake? Consider joining CLA! Is Carlyle Lake important to you? Do you care about facilities, water quality, lake levels? If so, you should consider joining CLA. The cost is just $10 per year. 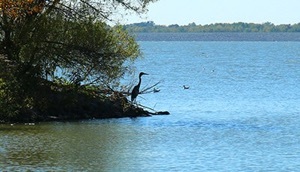 Your support will help keep Carlyle Lake as the best inland sailing lake in the country.